1. Christmas at John Lewis | 2. Sparkler fun on Fireworks Night | 3. Time to get the Christmas candles out - Yankee Cherries on Snow | 4. Interesting Lady Gaga pop-out in Elle magazine...still need to try the Fame perfume! | 5. Meet Bonnie, possibly the most adorable dog in the world. My favourite. | 6. First Gingerbread Latté of the season! | 7. Two new ChloBo purchases - post here | 8. Cosy monkey cuddles with my gorgeous little brother | 9. Babysitting results in a movie and some chocolate | 10. Never thought I'd find the One Direction boys in Vogue! | 11. Getting a little overexcited about the Halloween candy | 12. I met this friend in the pub..who knew dogs liked to drink?! | 13. A shameful addition to my running playlist | 14. Enjoying getting out all my snug Winter clothing | 15. The depressing ironing pile...a day of housework | 16. Three new additions to my wardrobe | 17. Loving my new lace top from H&M, not loving the lack of warmth it provides at this time of year | 18. Georgia in the swanky restrooms at the Sanderson | 19. My favourite Autumnal nail combination, post soon! | 20. Sipping on a cocktail during my Mad Hatter's Tea at The Sanderson | 21. Alice in Wonderland 'Drink Me' potion, a very cute (and tasty!) touch | 22. A night in with Made in Chelsea & a bowl full of sweet treats | 23. Feeling sorry for myself after a day sick in bed | 24. Looking a little crazy at the hair salon! 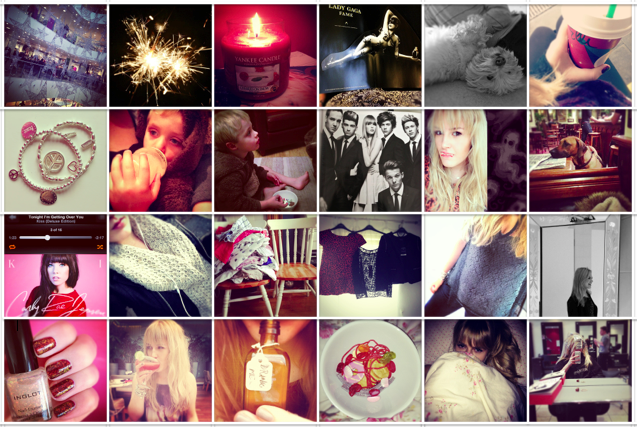 If you feel like following me on instagram my name is elle_pearson.